Genie and his brother Ernie travel to Virginia to spend the summer with their grandparents, since their parents are having marital difficulties and need time alone to sort things out. It's been a long time since Genie has seen his grandparents, and he does not realize at first that his grandfather is blind. Grandpop gets by very well in the house, and has an aviary which he tends, but is frightened of leaving the structured and safe environment of the house, especially after an incident outdoors. When Grandpop thinks that Ernie should learn to shoot a gun when he turns 14, neither Ernie nor Grandma think this is a good idea, but Genie and family friend Crab manage to sneak Grandpop out of the house to work with Ernie, with somewhat unpleasant results. Throughout the summer with his grandparents, Genie learns that while some mistakes can be fixed, it's much harder to make others right. Strengths: This had very realistic middle grade problems such as aging grandparents and parental squabbling, and wasn't hopelessly sad. There are also excellent details about life in the rural South (sweet tea sounds horrible, but Genie grows to enjoy it), and a support network of caring friends and family to help Genie through his difficulties. There are very few books that talk about learning to shoot guns, and there are readers whose families hunt who will find this interesting. Weaknesses: The subplot about the uncle's death in the military was unnecessary and slowed down the story, which came perilously close to the "nothing happens" category for middle grade. Philosophical musing is more often successful in young adult books, and that's Mr. Reynold's first field. 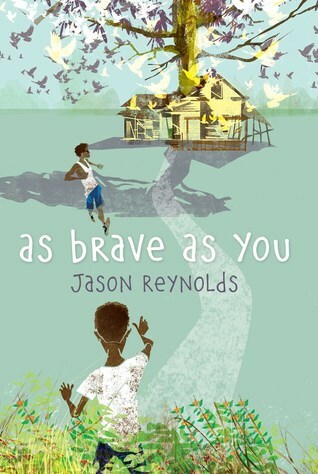 What I really think: At over 400 pages, this might be a tough sell, but it will be interesting to see what else Mr. Reynolds produces for middle grade readers. I did appreciate that the language and situations were tailored to this age group. I read this and several other books by Mr. Reynolds so that I could interview him for School Library Journal. I thought this article by Brook Stevenson at Gawker Review of Books was very interesting: Confronting Grief in YA Literature. Mr. Reynolds and I clearly have completely opposite views of how people should handle grief, which would explain why I had very little patience with the grandparents in this book, who were still struggling their son's death after 20 years. That's about 19 years longer than I allow myself. Everyone around here enjoys sweet tea--my wife likes "the kind you could stand your spoon up in"--but I grew up in the Mid-South, the Memphis area, and we all drank unsweet tea there. I've never learned to enjoy sweet tea, even after 30 years in NC. My wife thinks it strange that anyone likes unsweet tea. A house divided indeed. I agree that Reynolds's strong suit is YA. This was fine, but definitely too long. I did, however, like the country setting. We are in a mostly rural county of Virginia (on the outskirts of northern VA), and there's not that many books that feature African-Americans living in rural areas (other than historical fiction). Oh, sweet tea! I grew up in a suburb of New Orleans--we have New Orleans roots going back pre-Civil War, and my mother's family is from Austin, TX. We always drank unsweetened tea.